President Donald Trump officially recognized opposition leader Juan Guaidó as Interim President of Venezuela after Guaidó declared himself the country's leader amid cheers from thousands who were protesting in the streets. "In its role as the only legitimate branch of government duly elected by the Venezuelan people, the National Assembly invoked the country’s constitution to declare Nicolás Maduro illegitimate, and the office of the presidency therefore vacant," said Trump in a statement. "The people of Venezuela have courageously spoken out against Maduro and his regime and demanded freedom and the rule of law." Guaidó made the declaration as hundreds of thousands of Venezuelans marched in Caracas demanding an end to the government of President Nicolás Maduro. 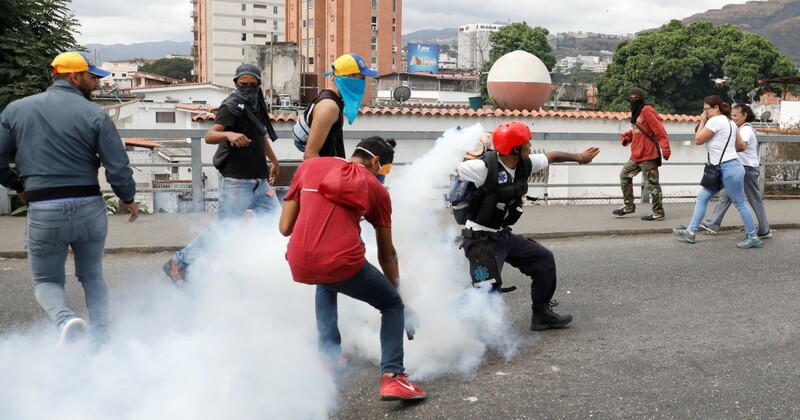 Edwin González, 24, a university student studying engineering, came out to march because he says it is their last chance to “get rid of the regime.” He has participated in almost every anti-government protest in the past. The protests were called to coincide with the anniversary of the 1958 coup that overthrew military dictator Marcos Pérez Jiménez – a historic date for Venezuelans. Maduro was inaugurated two weeks ago to a second, six-year term, which the U.S. and dozens of other countries have called illegitimate. González said the university he attends has suspended classes because it has not had running water for 55 days. Despite protesting to have the water restored, “like all government issues, they don’t work,” he said.